DCWV Going Green + a Give-Away! When we heard that Die Cuts With a View would be coming out with an earth friendly line...we were tickled 'green'. The honest truth is, when we think of a favorite company, DCWV is not at the top of the list. They are dependable and stable, but not too much on the cutting edge of what's new or setting trends. 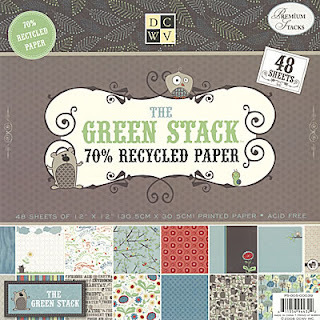 However, when we heard of this new paper line we thought it was worth checking it out. As we all know, most green lines (made from recyclable paper) have a brownish paper bag coloring to them. At this past Winters CHA we (Emilie and Heidi....the chicks writing this article) had the chance to walk over and check them the paper out. To our surprise their green line was missing the brownish coloring to it. The owner told us that it was 70% recyclable and when we asked them "how did you get the brown out of the paper? "...he said "It's a secret". Whatever the secret, we love this new line! Sticking with going green, Heidi made this layout about her dear neighbor Nina and her amazing ability of garden. Talk about an oasis in her back yard. Here's what Emilie made. A layout about her daughter who is a thinker. Even though this line is woodsy and filled with nature it can also be used for a very feminine girl page. Rub-Ons: Bo Bunny (Abbey Road) - other: staples, corner punch. - This green line doesn't have a brownish paper bag coloring to it. - We really enjoyed the color palate and the flower pattern paper. - You can also purchased a little cigar box of matching chipboard shapes, which includes an alphabet. - We noticed that the feel of the paper is different from standard paper. Kind of feels like 70's wallpaper. Not a deal-breaker by any means. i love that they went green! i keep a bucket on my sb table & put EVERY piece of paper in there & recycle it! every piece counts in my book! Awesome review! Great to know there are companies out there pushing what can be made in an environmentally responsible way!!! Kudos to DCWV! I love the idea of recycled paper, and the fact that it doesn't have the brown coloring makes it that much more fantastic! (I only worry if the process to take out the brown is not earth-friendly). I've been wanting to check out some of this paper. I really like what ppl have been creating with it. The only piece I've gotten to see is a tiny ATC that a friend sent me, so kinda hard to tell. I'm trying to go green where I can and would love to see more companies with recycled materials or packaging that can be repurpoed. Anything companies do to reduce/reuse works for me! I really like that woodgrain paper on Emilie's page. Haven't seen this line upclose, so not sure what you mean by the skunk graphic, but your LOs look awesome w/ the paper, so I'm definitely intrigued! Thank you for the review on this product. It is something I have been interested in looking into. What's with the skunk graphic?? I saw these papers and loved the cute little animals, and the fact that it's environmentally happy what could be better, except actually having some to play with. These papers are very cute!!! I have looked at "green" paper before but never saw any that I liked. I really love the blues of this paper - one could use it for so many themes - I will give this paper a try. And being "green" is very important for our planet, I believe, so it is a good idea to follow that line ! I like the design of the papers. I'll be honest & say that I don't think too much about the "greeness" of products but I know I should! I LOVE THIS LINE! The design is so mod! It fits withe the whole green look, I think. The texture reminds me of Daisy Bucket, too. This line is so cute. It does have a different "feel" to it but it doesn't make it hard to work with ... just different. Great review! I totally agree! This *green* line is unlike any I've seen before and I'm totally loving it! Just picked it up the other day at A's! I have always been a big fan of DCWV; love their textured cardstock and cardstack packs. The prints on their new pack may be a little challenging, but with two small grandchilden I'm sure I can use the skunk. its definately great to be able to find companies that are green and have innovative way to create new products. Great review and thanks for sharing this find. I think the paper looks cute! I am very intrigued to see the skunk graphic now though, LOL. I was sooo excited when I saw this line advertised a few months back. I have a ecofriendly daughter who has turned the whole house into being earth friendly & green. She's a scrapper, so thought she'd love to receive this as a bday gift. Found it at Michael's after Christmas & even used a 40% off coupon. She was thrilled. The papers tie in very well with a lot of the new die cut releases. I'm even off today to go buy another for a friend of hers who is also earth friendly. Great review! I may need to steal some of those papers for myself. I haven't seen this paper yet at my local LSS but I will keep my eye out for it. Thanks for the review. Please don't enter me in the giveaway because I have this paper already. (I haven't used it yet). One of the reasons I bought it was because it was the nicest lookiing "green" line I've seen. I'm a big fan of recycling and often use the plastic packaging (embossed with the cuttlebug folders) on cards and things. I'm also currently studying for an exam to becoome LEED certified for building green buildings. I wish more companies would manufacture products with recycled content. I like the line- I like that it is recycled and not brownish. I like the DCWV packs- although many of them have a few papers I just don't have a use for. I've seen that paper on projects through this magical crafty web world, but not in person yet...I'd LOVE to own some! It looks fabulous! I don't mind the 'brown' tint. But it is nice to see something brighter. I will have to go and check it out. Loving the colors, definitely different than the usual "green" lines. I have 2 wonderful boys that I could readily use the skunk (lil' stinkers :)) paper on. Thanks for the opportunity!! Its great that DCWV have gone green and I will definately look out for it. You have me intrigued with your comments about the feel of it too - I cant wait to see what you mean. I quite like the brownish tint on some recycyled stuff but its great that they have found a way round it. I am all about going green and love this paper pack. I saw it at my Joann's and didn't get it right away, well last time I checked they were out. I'm waiting for them to get more in! Even if it did have the brownish tint to it, I would still love it, I'm all about going green in any way we can. I think they're great!! I'm too young to know what 70's wallpaper should feel like - please enlighten me!! LOL!!! That definitely appeals to me... going green without necessarily having to look like it is!! I saw this on an online store and I actually liked it, especially since I've got a project coming up that will involve a lot of nature and the outdoors. Would love to win this giveaway! Thanks. This is great. We don't have any recycling bins in our housing area! They may use a toner, non bleach, to shade the paper to a whiter hue. That may also be why it gets an odd texture. This is a great step for any company to try and go green, kudos to DCWV. thank you for the informative article as well, ladies!!! Those papers are cute! I'm with you normally on DCWV, but these look great! I'd love to win! Recycled paper is awesome!! I think it's fabulous that they are doing this. Although, I hear you on the skunk thing ... I hate it when a piece of paper looks gorgeous in it's paper tray ... and then I pull it out and it has some random character on it. I either have to figure out how to cover it up or pass. I admit, I'm curious. With all the paper we go through, it would be nice to have some quality recycled papers as an option. Thanks for the chance to win some! These papers are so cute! Our family is always trying to reduce reuse recycle! It is great that they are coming out with quality recycled papers.They are so cute, I would love to win these yummy papers!! I kind of like DCWV because they have some innovative papers, like the glitter paper stack. I love to use those for mini-album covers. I would probably consider using their recycled paper, particularly if the texture is as you say. It might be perfect for covers, too! I use to not like DCWV but I have found that as my life gets more hectic DCWV is the way to go when trying to get a whole album done and now that they have a green line I am even more in love! I think the paper is adorable. Love all the animals. I have seen it in the store and I'm thinking the feel is almost, not quite as textured as bazill cardstock. It's great paper. I love the idea of "green" paper because I feel guilty about the amount of paper I use. The beautiful color scheme is just an added bonus! I think thats really cool that they went green! This line appeals to me as we love to spend time outdoors and do a lot of camping during the summer. These papers would work great! Thanks for the green review and one more way to help Mother Earth. The papers look wonderful. Will have to check for the Green paper line out at my Joann's. Thanks for the sketch too. I love that they have used recycled paper and from what I can tell, the designs look adorable! Is the texture of the paper similar to "new" paper? You have me interested enough to check this out next time I am at my LSS. I love that they made a "green" stack. In fact I purchased it the week that it came out. I thought those little critters were just adorable. When I bought it, I was having a bad day and that cute paper made me smile. Later, I thought maybe it wasn't so versatile, but recently I have been using it a lot. Not the skunk page yet, but I am working in it! Thanks for the review! I love that they are going green. Yeahhhhh.. I try to reuse everything that I can. lol.. My husband thinks im crazy but every little thing counts. Wow! Looks very "cutting edge" for DCWV. Glad to know they're trying! I'd love to play with this paper. I would feel good about "doing my part" with that paper line! Thanks for the chance to sample it. I may run out tomorrow and see if I can take a look in person! I like the idea of thinking green... I will be looking for this paper when I am out next time. I recycle everything...including all my paper scraps. I use packaging, and etc... I think its awesome they're going green! I actually love the skunks on it. My little girl's nick name is Stinky Binky and I was anticipating buying this line for that very reason. And the fact that it's 70% recycled. appearance to it, which I love. Also lovein' the idea of the recycled paper! I love the idea of recycled paper. I would love to play with these beautiful papers! Love this new line, and LOVE that it doesn't have the "brown paper bag color" to it. Very nice. I try to recycle as much as I can. I love that some company go green!I will definitely try those "green" paper line! I am all about going green as much as possible. This is just another great excust to buy more scrap paper!! :) I love this line and think it is so adorable and versatile. I would love to own some of it!! Beautiful layouts!! It does make me want to check it out. It's so refreshing to something that has a new idea to it. Happy to see companies going green and I love that paper!!! Thanks for another great review. I think that it is about time for the SBing industry to think about the impact that it has on the environment. So even though I might not go out of my way to buy this line I applaud the effort! And I love the Sketch BTW!!! I'm all about scrapbooking being "Green". I definitely would be more inclined to buy products that were "green". Great article too! I do normally prefer the green side of things, but did not think it was possible in scrap papers. this has got me curious to see if the feel of the paper outweighs the "greenness"
What a great idea to have "green" scrapbook paper. The colors are so crisp and clean. I'm moving more and more towards a greener life, but my wallet often gets in the way. If these products are in-line price ways with regular scrap products, I'll definitely take a close look at them. In fact it's given me a really neat idea...I'll have to keep that a secret for a little while, but now I need to get my hands on that paper. love your feedback on this item. i have been wanting to check it out and i am intrigued that it doesn't have that total brown bag look. :) great layouts too! You guys are doing a good job so far!! Keep it up!! I'm all for going green so thanks for the review! I love DCWV but I just can't buy the stack with that much paper. I have too much in my stash to add multiple sheets! I am excited that they are going green. I really love to try green products. The paper looks really cool! I have bought this paper and used it. I love the fact that it is green, but it is definitely pricey. I thought you could buy individual sheets though. I love the sketch ideas...keep them coming. guilt free scrapping...it doesn't get any better. i think it's great that they have gone green! the papers are mostly cute, but i agree about the big graphic at the bottom limiting the creative possibilities. but i would probably just cut it off and use the rest! 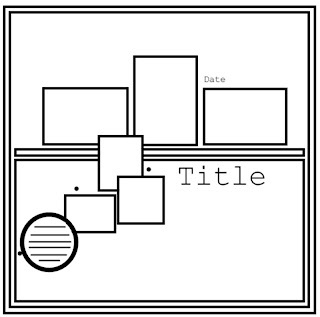 I think it would be cute for card making! I think it's great that they have a 'green' line of papers...I like 'em! While I haven't used it myself, I did see some friends scrap with it this weekend and it was really cute! The skunk and owl/squirrel pages worked fab with the little boy pages. And, I love that it "green"! I've had a chance to work with this line for the lss and I love it! It's not my typical style, but I was surprised to find how fun it was to use. I too was impressed that it didn't have that recycled brown color to it and the texture is great! It's a cute, cute line! I like the paper pack & going green is a plus. I don't really care for all of the cute critters I would of rather them be in a die cut or something so I had the option of putting them on there. Greenishly delightful Paper!! Love it! I like all kinds of patterns, so that doesn't bother me. I am so happy that DCWV is going green. It will be interesting to see if other companies follow suit. Love the papers. I saw this stack at my local Joann's a few weeks ago, and when I went back to purchase it, they were sold out! Yes, fan of going green here! I love the idea that more manufacturers are going green. That pp is super cute and the fact that the brownish tint is missing puts it in the plus. I like DCWV, especially the cardstock. Wouldn't it be great if they had green cardstock too to go with these green patterned papers? The critters are cute. I think the patterns are adorable. I'm so glad to see a scrapbooking company taking the steps into being more environmentally friendly. Thanks for the chance to win. Green is Great! I wish more manufacturer's would figure out their "secret" to make such a great line of "Green" paper. And as far as the large woodland creatures you guys talked about - that would be great for our family! My husband, my daughter and I all spend a majority of our time out in the woods and have MANY adventures to scrapbook (including my daughter being bitten by a snake she was checking out - it wasn't poisonous). I would love to check this new line out. THANKS!! I love that there are green products on the market for scrapbooking. I recycle at home and try whenever possible to recycle small paper scraps and cardboard from product packaging and anything else that I can. I looove the colors :-) We all have to think a bit about the environment, so I thinks this is a great initiative! I can't believe that they made recyled paper look so good! I hope that they keep it up & use recycled paper for all of their lines! Great looking recycled paper!! I'd love to check it out!! I think going green is great. But to be honest it would not be the MAIN selling point with me. I buy paper becuase I like the looks of it, or it "works" with what I have in mind. And of course becuae I am addicted!! However I do like this paper line, for the most part. The pages with the creatures....well if the creature doesn't fit what I am doing it can be covered with another paper or photo. Bought my first DCWV paper stack last weekend and made some wonderful layouts with them! Now I am a HUGE fan! Would love to get my hands on this paper stack and turn green all over! You know, I've never been a huge fan of DCWV, but I am really loving this line! I feel in love with this line when I saw it advertised a month or so before release. I find the woodland creatures adorable and the fact that it is Earth friendly is a big fat bonus!! It's good that more companies are trying to increase the recycled content of their products. Have been enjoying one of their older packs recently - would be fun to update with new product! I adore the designs in this pack, and I do like the feel of planet friendly paper, it kind of fits the theme of these designs. I would love to win this lovely pack - I dont mind papers with 'awkward' elements in a corner - I feel less guilty chopping them up for mini-projects then lol! I love the idea of any scrapbook company going green! It's a wonderful idea! I personally love this paper! I think it is so cool and I think you could do a lot with it! I love this paper pack, so cute and fun and good for the planet!